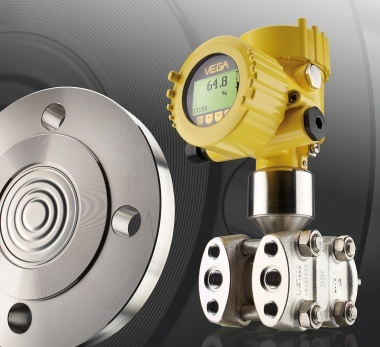 Measuring principle - The separating diaphragms of the differential pressure transmitter are deflected by the existing pressures. The filling oil transmits this pressure to a semiconductor measuring bridge, the differential pressuredependent output signal of which is measured and further processed. The advantages of this sensor are the high system pressure up to 24 bar, the excellent long-term stability and the very high unilateral overload resistance. Applications - VEGADIF 55 differential pressure transmitters can be used for manifold applications, e.g. for flow measurements in conjunction with effective pressure transmitters in gases, vapours and liquids. Also level measurements in liquids and pressure monitoring on filters and pumps are wide-spread applications.